The first material must be suitable to twine into a rope that has a suitable combination of strength and durability whilst still retaining a pliable quality. The materials preferred for kishie simmens would be soft rush (juncus conglomeratus or effusus); cleaned straw (gloi) avena strigosa; or marram grass (bent). Other materials can no doubt be used but these are the ones commonly used and of known suitability. The second material must be suitable to form the structure of the kishie these hjogs or een form the vertical stakes. 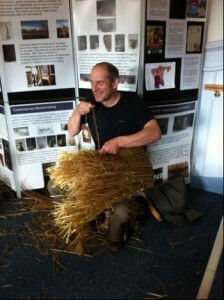 The most common materials for use as hjogs are either gloi (cleaned Shetland Aet straw) or dock weed stalks. The Shetland Aet straw is both long and supple and preferable to modern “white” oat straw which is shorter and more brittle. Dock stalks are used dried hard after being cut in August/September and cleaned of leaves/seed heads. These need to be soaked preferably in salt water prior to use. Dry, clean and prepare materials required. Twine simmens to a total length of 22 fathoms (132 ft) for a reasonable sized kishie. This is a two strand twine. Once you have completed your simmens you find the middle and make two clews (balls of twine tied so that the centre of the clew can be pulled out with a little resistance. You should be seated to make your kishie and have your hjogs under your chair. Your first hjog is laid with its middle across your knee and the middle of your simmens in a bight over the hjog with the top clew lying over to the left of the hjog. The simmens below the hjog should be tensioned upwards and held in position with your teeth or around your neck. Lay in the next hjog – progressing away from you. Pass the simmens which were in your mouth away over the top and to the left of the new hjog, pull the bottom simmens up and tension with your teeth. Carry on this process until you have laid in 20 hjogs. The next hjog will be placed in the basket but remain folded in two. This forms the bottom corner or shoulder to open the kishie out and stop it becoming an envelope. The tension on the simmens is important here as the loop of the hjog is being held purely by the simmens and it must not pull out later. Now, there is a tricky movement where you must maintain the tension on the simmens but lift the basket off your lap and turn it clockwise and then you start on the right hand side of the basket and make away from you as above. Passing the simmens only. No further hjogs to be added until you get to the other end. The spacing between rows of simmens is 2 fingers between in the bottom and increasing to 3 once you get above the third row of waeving. Add another hjog as 11. Turn the basket and proceed as13. When you reach the end this time you must split the end hjog into two equal handfuls again and set another hjog in between the two halves. The process of weaving and adding additional hjogs must continue until you have 5 hjogs in each end. Weaving with the simmens continues until you have 8 geng (turns) around the basket. Now you wave until you get to the corner hjog where you stated and start to turn down the hjogs to make a mouth to the basket. Fold your hjog right down across the next hjog and make your weave across both to hold them tight together. You must continue right around the basket doing this until all hjogs are folded down. The last hjog will have no neighbour to fasten to and you just fold it down and put a firm reef knot on with the simmens to mark the folding down. Next you take your kishie needle. Wooden needle 6-8 inches long with eye suitable for simmens dimension. There should be sufficient simmens left to sew in one direction and you will need at least 3 times the circumference of the kishie mouth. You start sewing pushing the need le inside first and pulling up the slack and then out between hjogs just below the last simmen at the top. The stitch is like a back stick in sewing. You do not sew around every pair of hjogs but instead every second pair. Sew all the way round trying to keep tension on without breaking your simmens. This will stiffen the mouth of the kishie. When you have sewn right around tie off again in a reef knot with the simmens still remaining from the other clew (bundle). Now you cut off the loose simmens and thread any ends away. The spare hjogs can be cut away. Cutting downwards leaving an end of approximately one inch long. The outside/inside of the basket can be singed to clear off any loose straw. DO NOT SET FIRE TO IT! Twine together three lengths of simmens for a fettle (carrying band) and hwip these at the ends to hold them together. The carrying band should be fastened at two points on the back of the kishie diagonally across the third row down of simmens. I would suggest buying the video of Lowrie Copland making a kishie from the SBC to help you.